"As a behaviorist, this is the time when the most GOOD can be done. And watching a puppy pick up new things can be a sight to behold. When that light bulb goes on you can see it in their eyes." "The first time you see your dog working, how they understand the ‘human’ condition, you begin to understand our logo. 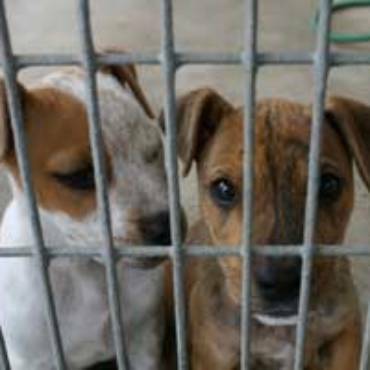 Dogs have ‘something’, a power over the human spirit that just can’t be explained." Watch this smart little Aussie learning to come! Puppy training at Kindred Souls Canine Center. 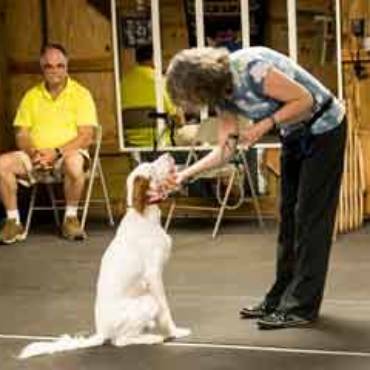 This video demonstrates heeling patterns with distraction. Fiona is a 4-5 year old Female Siberian Husky. 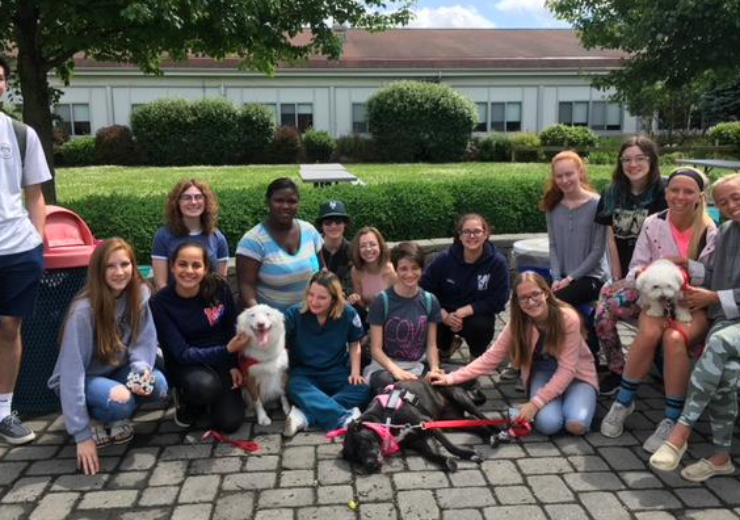 Our devoted Therapy Group led by instructor Chris Lehmann held a De-Stress day for the kids at Wall high School to give them some Therapy Dog “therapy” before their finals. Great job! and Good luck kids!! Hi Pete, Thank you so much for taking the drive down here and talking with the staff. I had several of them (more than half) tell me how much they enjoyed a down to earth and realistic approach to dog behavior, not to mention your comedy. They all have been talking about it since. Some asked about joining your class others want to come and observe some to learn more. So thank you for the inspiration! Great job as always! We started the Basic Obedience class at Kindred Souls 5 weeks ago (this is an 8 week class) I am absolutely amazed at the positive changes in our dog. Fala is a 10 month old lab mix and has a TON of energy. We had trouble with everything - sitting, staying, down - the only thing she was good at before Kindred Souls was sitting before eating. She now walks nicely on a leash, sits when I stop, sits on command, lies down on command. We still have some work to do, but the step by step guidance in the classes as well as the clear homework instructions have helped us with Fala so much. She is so well behaved now - we went to another puppy class at another place and Fala was the worst behaved dog in the class - the tools we were given weren't working for us. After this class I feel we have a great foundation - it takes some work but it is well worth it! I highly recommend this center and will be looking at other classes once we finish the Basic Obedience. 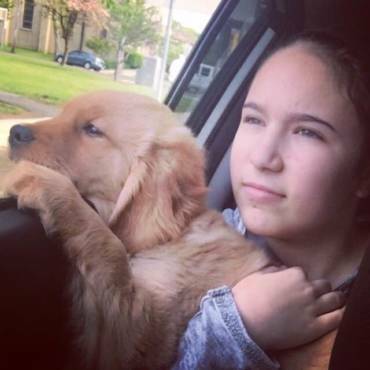 It's all about the dog. Good manners and pet safety are the foundation of their program. The trainers here teach you how to communicate with your pet to nurture a mutually respectful and loving relationship with your dog. 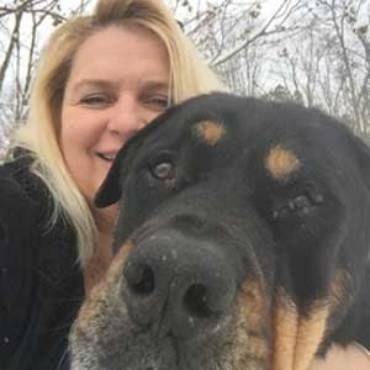 From large dominant breeds to frightened submissive rescued pets, each animal is given the same set of expectations and each owner is taught how to manage their particular pet's needs. Over the past 12 years, 4 of my dogs have passed through the Kindred Souls program and I recommend them to anyone who asks. We just finished the Basic Obedience class with our high-energy 3-year old pit mix rescue, who we adopted four months ago. We learned how to effectively work with our new family member and how to channel her energy into creative games and weekly homework lessons. I have to say that our dog has done a total 180-degree turnaround for the better, both inside and outside our home, and I look forward to more advanced classes in the near-future with Pete and Kindred Souls. Winston, our newly rescued 1-year old Standard Poodle, is the 4th family pet we’ve taken to Kindred Souls over the last 12 years. We choose to come back because we get consistent results every time and the whole family is welcome and encouraged to come to each session. Our previous dogs have been large, dominant breeds, that needed a firm leader but this time is different. Winston is a quiet soul with an unknown history. He is timid and fearful, especially of men. Although, we didn’t know how to help Winston, we knew Pete would. Pete has helped us understand that we need to change our tone of voice, but not our level of expectation with this particular dog. 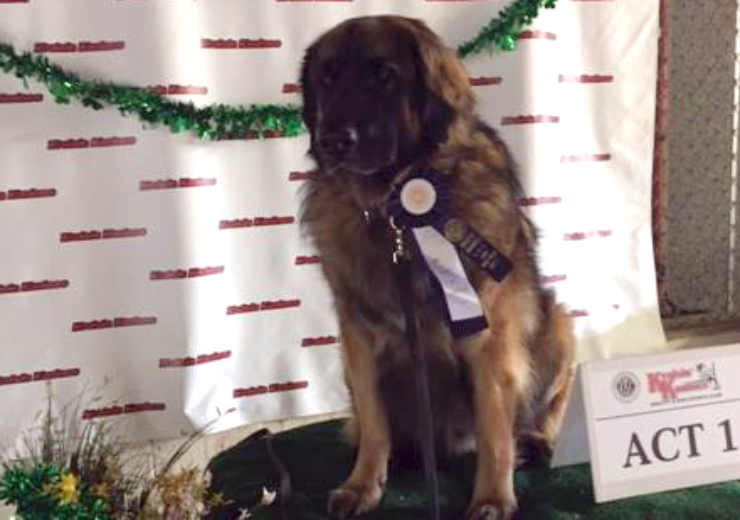 Our goal is to help him gain his confidence by giving him a baseline of basic obedience with commands that are consistent from each family member. We’ve learned techniques to help us get past Winston’s fear of being approached so we can get down to the work we’re there to do. Already, at just week 3, we are seeing big results. Winston’s anxiety is waning and he’s starting to relax. The group setting helps us learn through others. When someone else is having a particular problem, I can see how they get it resolved so I can handle it if it comes up with my pet. Questions are encouraged, even when it’s beyond the scope of the class at hand. Homework is reasonable, easy to work into a busy household schedule, and so, so rewarding when you get results. And at Kindred Souls, results is what you get. This place was great for our rescue. She is a very timid dog, and pete was fantastic with her. The owner/trainer has a very strong personality which can take some getting used to. He is very gruff and isn’t afraid to yell at the OWNERS (not the dogs) if it’s obvious that the owners aren’t doing the homework. Pete is very specific about saying that we are there to make your dog the best dog that he/she can be, and not to make your dog a perfect dog like border collies (who are very very smart). I would not hesitate to bring our dog here again for the next class except that we moved so it’s a bit far. Don’t come here if you are not a motivated dog owner.